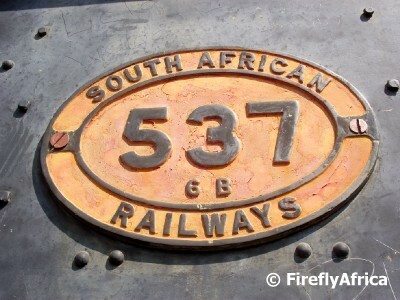 On the way up the hill to Fort Klapperkop and the SA National Defence Force Memorial outside Pretoria stand an old steam locomotive. 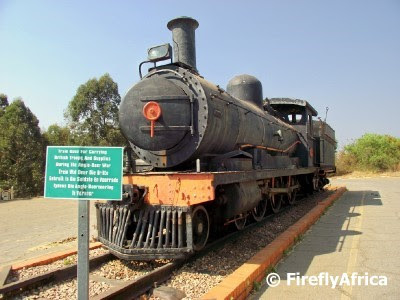 This specific locomotive was amongst others used over 100 years ago during the Anglo Boer War (1899 - 1902) to carry British troops and supplies from the coast to where the war was taking place in the interior of South Africa. 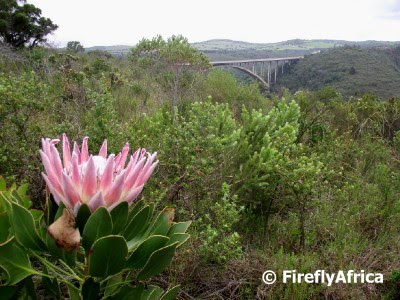 The Van Stadens Wild Flower Reserve is situated about 40 kilometers west of Port Elizabeth. The reserve is 450 hectares in size and includes both pristine fynbos along the plateau and coastal forest in the gorge. There are several hiking trails through the reserve and one of them will take you to the spot from where the Van Stadens Bridge is visible. One of the magnificent flowers that grow in the reserve is the King Protea, South Africa's national flower. 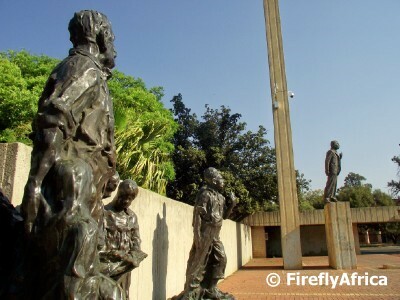 The South African Defence Force Memorial is situated just outside the entrance to Fort Klapperkop in Pretoria. 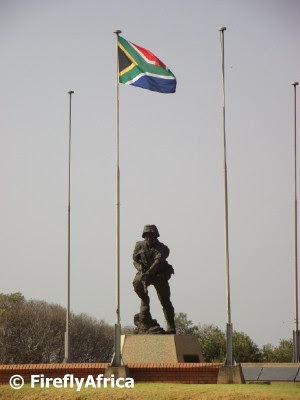 The memorial was unveiled on May 31 1979 and includes a statue of a soldier holding a R1 rifle, in memory of all members of the South African Defence Force who lost their lives serving their country. The individuals who have lost their lives are honored with an inscription on a number of marble plaques mounted around the statue. 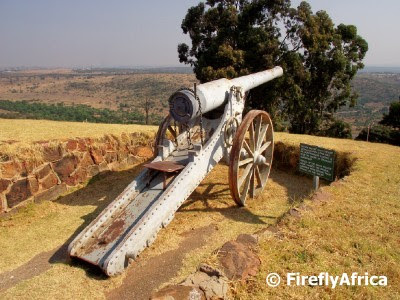 Sitting on top of the koppies (hills) overlooking Pretoria is a number of forts that was built prior to the Anglo Boer War in the late 1800's. After the abortive Jameson Raid in 1895, the South African Republic (also known as the Transvaal Republic) had a number of forts built to protect their capital in case of a foreign invasion. 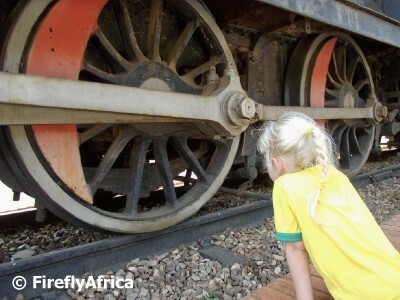 The Pretoria Forts consisted mainly of four forts, three of which was constructed by a German company. 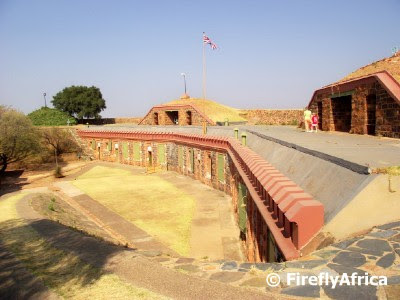 I have on a previous visit to Pretoria visited Fort Schanskop which stands close to the Voortrekker Monument. 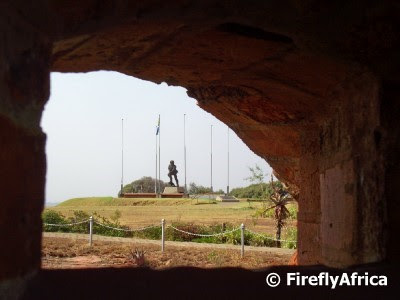 This time around I popped into Fort Klapperkop for a quick look. The three forts are pentagonal reinforced, with more fire range possibilities through numerous facets. Attacks from any direction could be warded off by revolving guns on their ramparts. 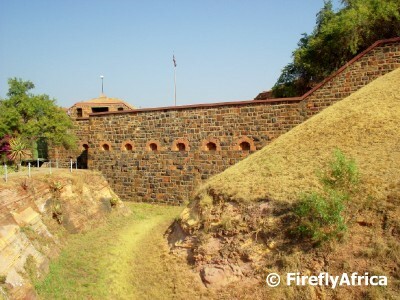 In January 1899 the fort was manned by 17 troops and by mid year the number of troops was increased to 30. 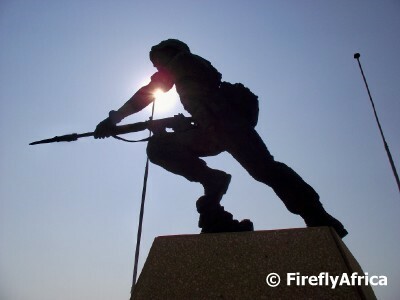 By the end of the year only 16 troops were still stationed at Fort Klapperkop as men and armament were gradually withdrawn and sent elsewhere during the course of the war. 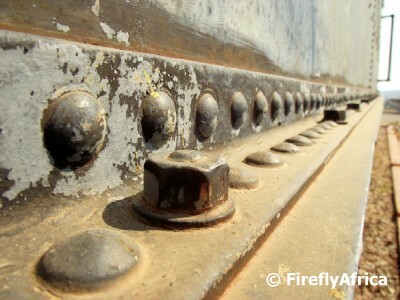 To prevent infantry attacks the forts contained loopholes were built into the walls. Trenches, barbed-wire entanglements and fortified rooms were erected as reinforcements. Fort Klapperkop was the only one of the forts that had a moat as well as a drawbridge. Apparently the moat was never filled with water. The main weapon on the fort was a 155mm Creusot gun, better known as a "Long Tom". 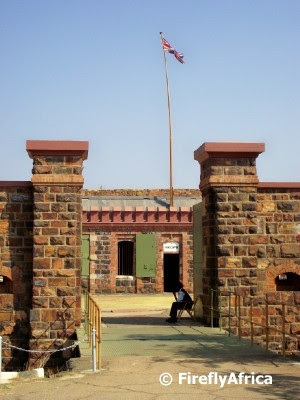 Fort Klapperkop is a Gauteng Provincial Heritage Site and a South African National monument and is run as a military Museum. 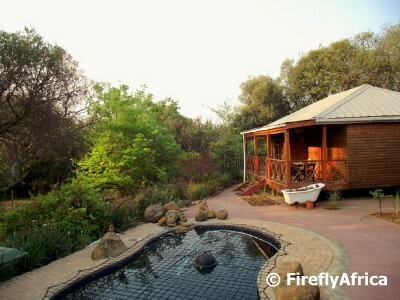 I recently had the opportunity to stay at Klip-Els Guest Lodge in North Riding area of Johannesburg. The place was such a surprise to me when I got there. 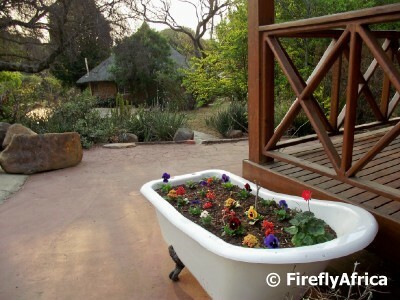 Although the guest house is in Johannesburg, its situated on a 3 hectares property. 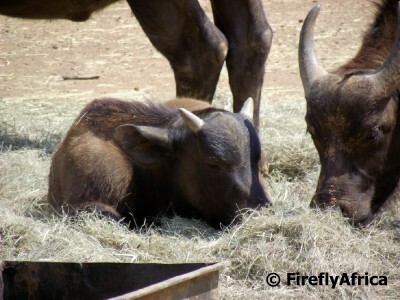 This gives one the feeling like you are somewhere in the bushveld rather than in the city. Although you can hear some traffic somewhere off in the distance, you wake up to the sound of bird calls rather than city life. 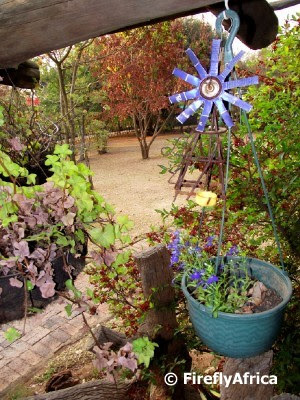 The name Klip-Els refers to the Wild Coffee tree that is one of the many indigenous trees that grow on the property. 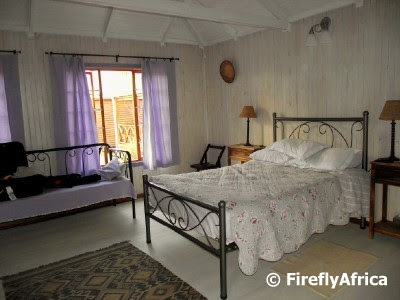 Klip-Els has both guest house rooms as well as chalets outside in the garden. I stayed in one of the chalets and just loved it. The chalet was very spacious with an uncluttered style. I think the part I loved the best was sitting on my chalet's veranda with a drink at sunset. I closed my eyes and imagined myself somewhere in the Bushveld. As we entered Johannesburg on our recent visit, Chaos Boy asked if we were in Soccer City now. I was very impressed that he associated Soccer City with Johannesburg. He was of cause not refering to the city itself, but to the soccer stadium where the final of the recent 2010 FIFA World Cup took place. 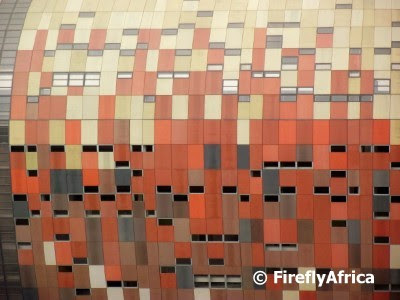 We dicided to fit in a quick stop at Soccer City during our stay in Jozi. 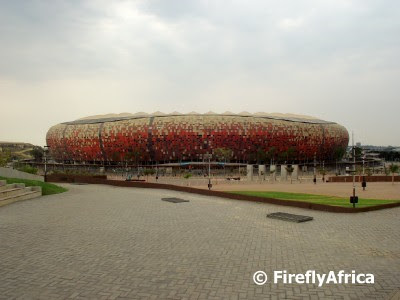 Even though most people refer to the stadium as Soccer City, as that was what it was known as during the World Cup, the official name of the stadium is the FNB Stadium. 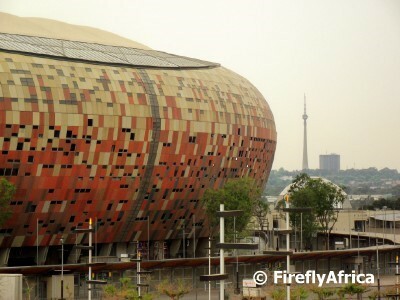 Soccer City is situated close to Soweto on the western side of Johannesburg. The stadium was revamped before the World Cup and became the largest stadium in Africa. It has a seeting capacity of 94 700 people. With it being so big one would think that some spectators would be quite far from the action, but nobody is seated more than 100 metres (330 ft) from the field, and there are no restricted views in the stadium. The stadium has a very unique look. It was designed to resemble a calabash which is another word for an African pot or gourd. Its a pity there were no games on when we were in Gauteng as the stadium is stunning at night with its lights shining through the gaps in its exterior. Truly a world class stadium. 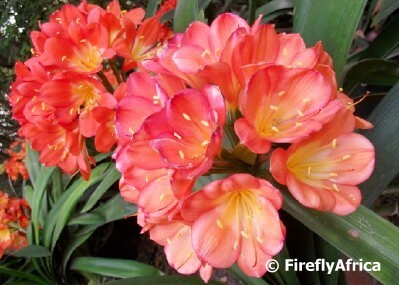 This is the time of year that Clivias are in full flower. 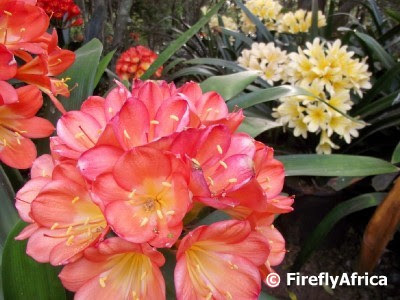 The Clivia (pronounced Clee-via) is a flower that is indigenous to Southern Africa where they grow wild in forested woodland areas. 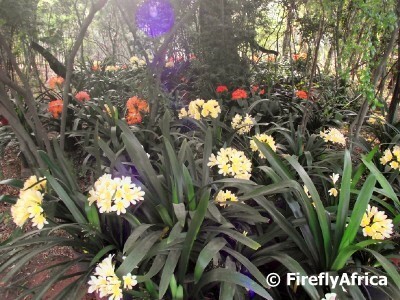 The Clivia plants are all members of the Amaryllidaceae family. 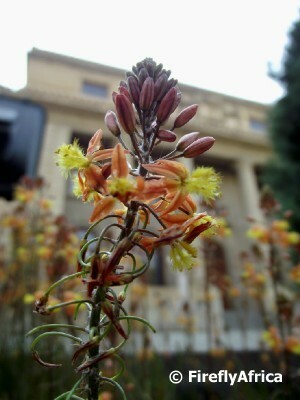 The plant's flowers are carried in clusters on stout stems and range in colour from yellows to rich oranges and shades of deep red. The leaves are strap shaped, fleshy and even when not in flower the foliage provides excellent dark green cover. Clivias are prized for their ability to grow and flower in shade and is the ideal plant for massed planting under trees or in shady areas. They are extremely hardy and drought-resistant but do not thrive in direct sunlight or frost areas. Today I just want to post a couple of big bird photos I took at the Johannesburg Zoo to end of the Jozi Zoo trilogy of posts. 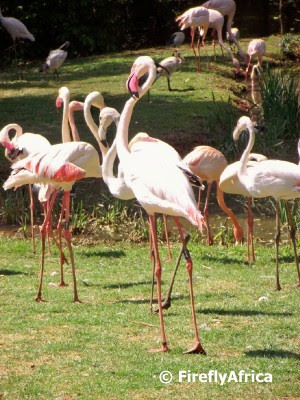 The ﻿Greater Flamingoes (Phoenicopterus roseus) at Jozi Zoo has their own enclosure. 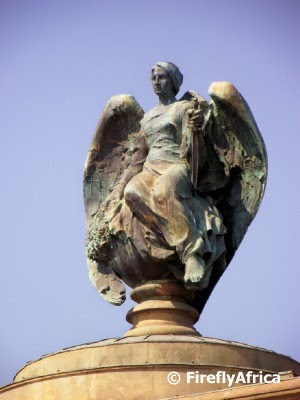 ... on top of the war memorial at the Military Museum next to the Johannesburg Zoo. The memorial is visible from the top section of the zoo. Following yesterday's post on the Johannesburg Zoo, I decided to post a couple of random animal photos I took on our visit. I have said so before and I will say so again (and again and again and again) that I much rather prefer to visit a game reserve and look for the animals in their natural environment. The problem is that not everybody in society gets the opportunity to visit game reserves and thus zoos will always be the only place a lot of people will see wild animals. 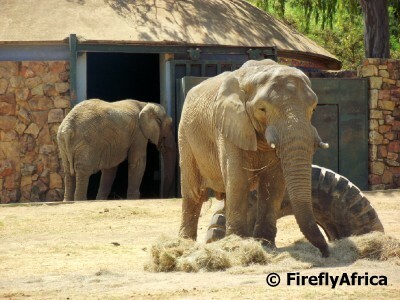 The elephants enclosure at Jozi Zoo must be one of it's most popular spots. Its situated roughly in the middle of the zoo and most of the paths pass it, so a lot of people stop there. I feel a bit sorry for the elephants in their treeless enclosure if I think of the elephants in the Addo Elephant National Park close to Port Elizabeth with so much space covered in Valley Bushveld and grasslands. The Cape Buffalo, another of the Big 5 that one can see in the zoo, had a baby in their enclosure. 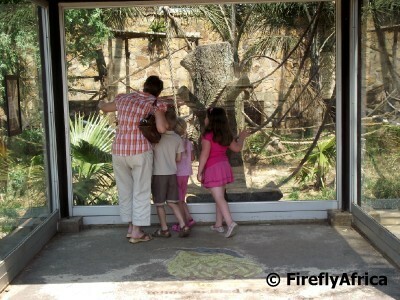 Now here is where one of the up sides of the zoo happens. In the wild you probably wouldn't always get such a clear shot of a Buffalo calf unless you sit in one spot for a very long time. Just a pity the sun wasn't right and threw a shadow on his face. I loved seeing the hippo. The game reserves around here doesn't all have hippo and you don't always get to see them cause they are more active in the evenings. 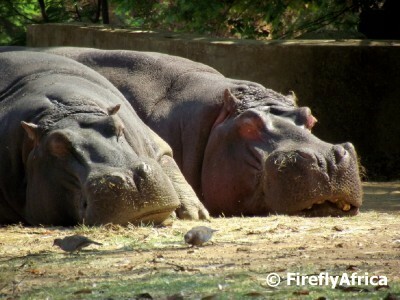 These guys seemed quite content on having their afternoon nap in the sun. Something that doesn't occur down in the Eastern Cape naturally is the Nile Crocodile. 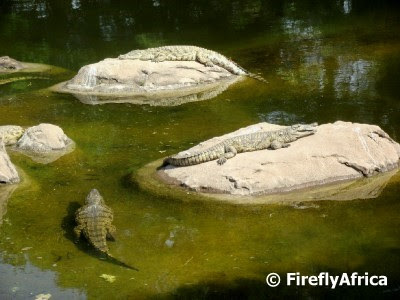 In actual fact there is only one game reserve near Port Elizabeth that has crocs as far as I know. The last animal I want to show is an exotic. The Capybara is the world's largest rodent. 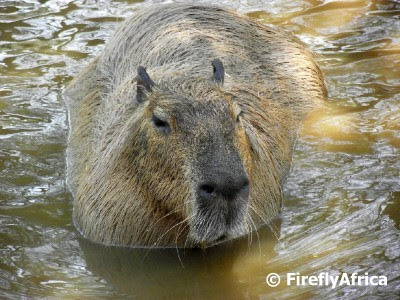 They are found in southern Central America and northern South America and are semi-aquatic, spending a lot of time in the water. This guy put up quite a show, rolling and diving around for us in the water. On our recent trip up to Gauteng we stayed with friends in Johannesburg for a couple of days. The Sunday we was a stunning day and our friends suggested that we go to the Johannesburg Zoo for a picnic. 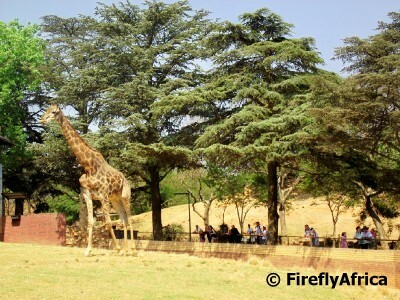 I have had an opportunity to visit Jozi Zoo on a previous visit, but my family has never been there and even though I personally prefer game reserves over zoos, I though the kids would really enjoy it. Plus any trip with a photo opportunity is a trip worth doing. 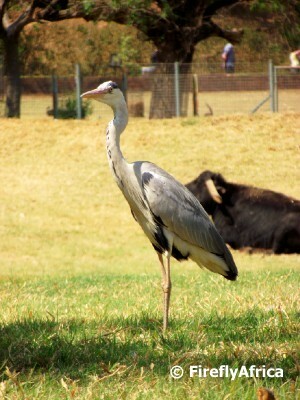 The Johannesburg Zoo was established in 1904 and is situated surprisingly close to the city centre. 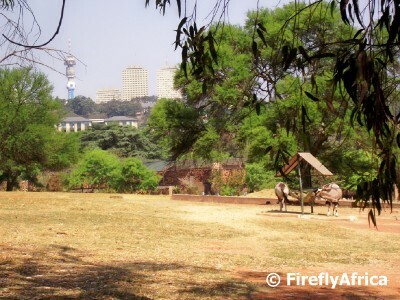 As you walk up to the top section of the zoo, the Johannesburg skyline is visible in the background and you realise that you're not out in the countryside somewhere but right in the heart of the biggest city in South Africa. I was very disappointed with the Rugrats' reaction to all the animals. They showed very little interest and there was no "ooooo's" and "aaaaa's" at the lions or elephants or much else for that matter. Perhaps they have the "want to see it in the wild" blood that runs through my veins. They much rather wanted to run around and play. Once or twice they did stop long enough to admire something. In the picture above the Damselfly is pointing out a baby white handed Gibon to them. 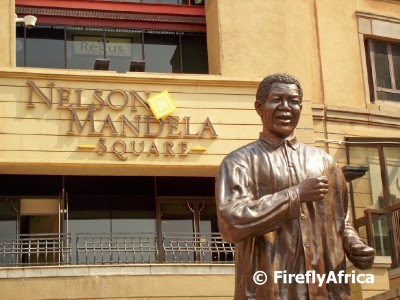 I have posted about Nelson Mandela Square next to the Sandton City Shopping Centre before (here and here), but on my recent visit to Johannesburg I couldn't help but snap another few pics to post on here. 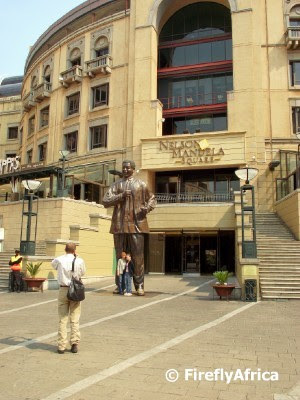 It was also the first time that I was in Jozi with the family and wanted to show them all the sights that I have only told them about. The six meter high statue of Nelson Mandela standing in the square is the main attraction for visitors. It's impossible to stand there for longer than a minute or two without somebody posing for a photo at Madiba's feet. The tall building in the background is the landmark Michelangelo Towers which stands 143 meters high and must be one of the most distinctive buildings on the Sandton skyline. This is my last Bloemfontein post from this trip, I promise. I was actually very disappointed that I didn't have time to explore the city some more. I have never been to Bloemfontein before and it has so many places, most of historical value, to see. 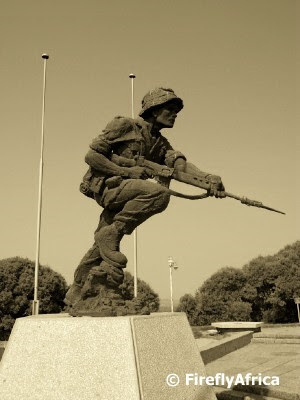 The one thing I did notice is that there are many statues around Bloemfontein. 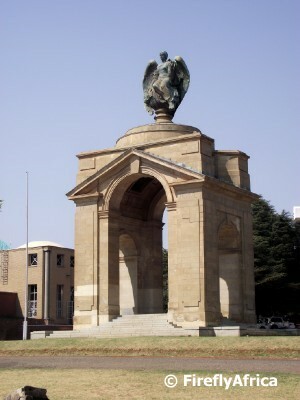 Bloemfontein used to be the capital of the Boer republic of the Orange Free State﻿ and many leaders involved in the Anglo Boer War and in the establishment of the Union of South Africa came from here. Below follows a couple I saw. Some of them you may have spotted in posts over the last week already. 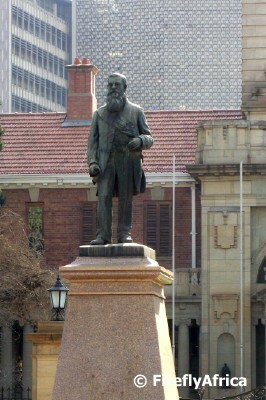 Standing in front of the Fourth Raadsaal is the imposing figure of General Christiaan de Wet (1854 - 1922). De Wet played a major role in the Anglo Boer War (1899 - 1902) as a general. During the war he was regarded more and more as the most formidable leader of the Boers in their guerrilla warfare. In 1902, during peace negotiations after the war, he even acted as State President of the Orange Free State ever so briefly. For only two days in fact when Presedent Steyn had to leave negotiations due to illness. Hertzog Square across the road from the Bloemfontein City Hall, stand a statue to James Barry Munnik (JBM) Hertzog (1866 - 1942). Hertzog rose to the rank of general during the Anglo Boer War, becoming the assistant chief commandant of the military forces of the Orange Free State. Hertzog became Prime Minister of South Africa in 1924 when his party defeated that of Gen Jan Smuts. He stayed in office until 1939. Francis William Reitz (1844 – 1934) had an extremely varied political and judicial career that lasted for over forty-five years and spanned four separate political entities. Reitz started his political career as a representative on the Cape Colony Parliament. He was Chief State Justice of the Orange Free State ( 1876 - 1889) before becoming the Boer republic's 5th State President (1889 – 1895). From 1898 until 1902 he was the State Secretary of the South African Republic (the Boer republic of the Transvaal) before being President of the Senate of the Union of South Africa from 1910 - 1921. 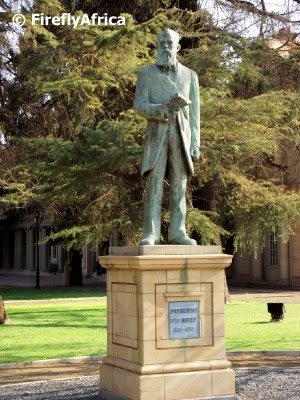 The last statue I want to show is that of President Johannes Henricus Brand (1823 - 1888) in front of the National Afrikaans Literature Museum. 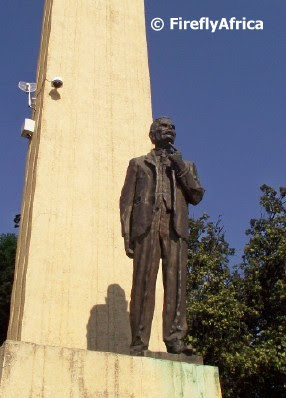 Brand was the 4th State President of the Orange Free State from1864 until his death in 1888. He was such a popular president that the main road in the Bloemfontein city centre was named "President Brand" in his honour. 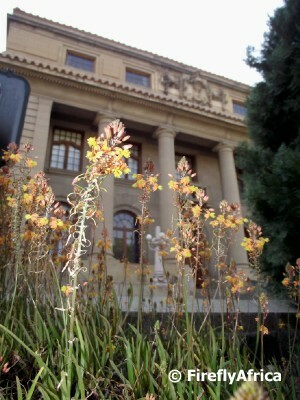 During the Apartheid years Bloemfontein was called the judicial capital of South Africa. That was because the Appeals Court of South Africa is situated there. 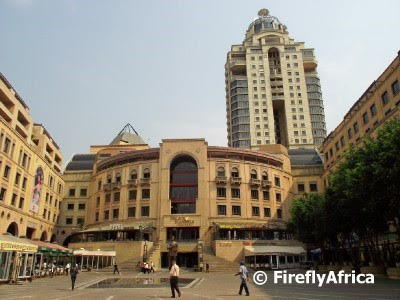 It used to be thew highest court before the establishment of the Constitutional Court in Johannesburg. In 1996 it was renamed the Supreme Court of Appeal of South Africa by the Constitution and it has 22 judges presiding there. 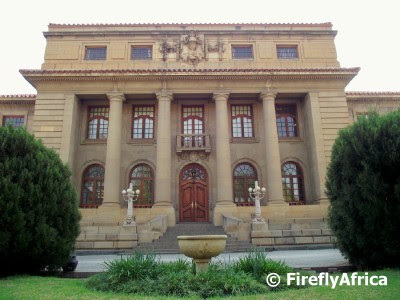 The court was formed with the formation of the Union of South Africa in 1910. The Court initially used accommodation in the Fourth Raadsaal across the road. 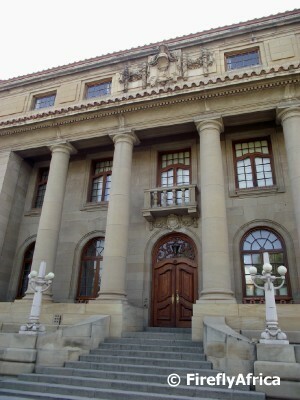 The first and only court building was opened on 1 October 1929 and was extended in 1967. It is currently being refurbished and extended to accommodate the increase in the number of cases heard by it and the increased number of judges. The building is said to have been built in a free Renaissance style. 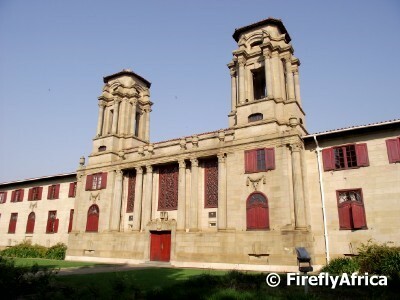 The old part was built with sandstone from Ladybrand and the newer eastern wing with sandstone from Ficksburg. The new part of the building is being similarly clad. 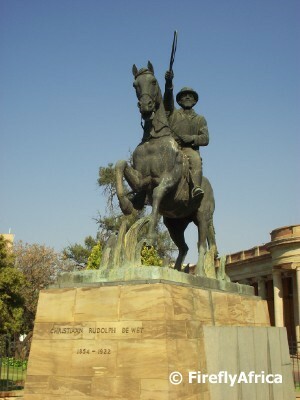 Across the road from the Bloemfontein City Hall in Hertzog Square stands a fine monument dedicated to General JBM Hertzog. General Hertzog was a military officer in the Anglo Boer War (1899-1902) and later became Prime Minister of the Union of South Africa. 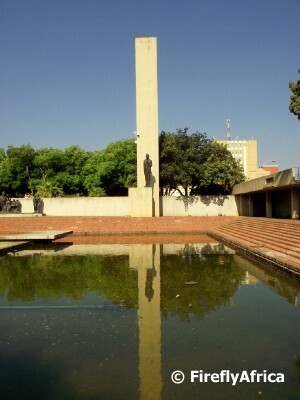 Hertzog Square consists of fountains, a reflection pool and the statue created by sculptor Danie de Jager and unveiled in 1968. There another sculpture on the square of which I haven't been able to find any information. 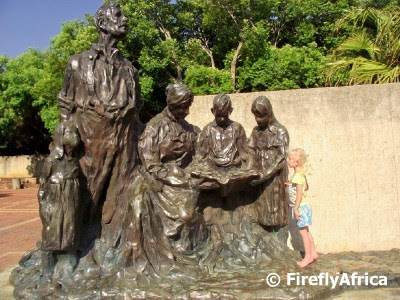 The male figure in the sculpture looks like he could be Gen Hertzog as well so I assume that its a Anglo Boer War related monument. 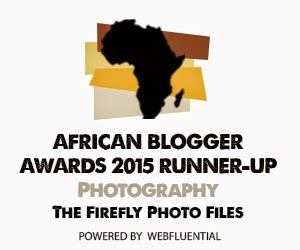 I hope you're not tired of Bloemfontein yet, but there are still a couple of things to show you. 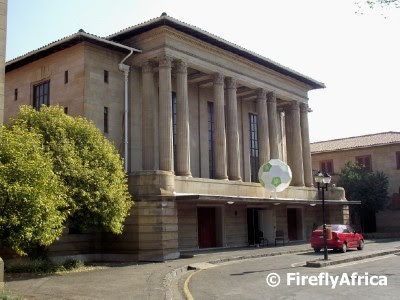 Bloemfontein's City Hall is a stately sandstone building designed by Sir Gordon Leithe. Even though its looks like a very old building from the outside, it was only built in 1935 and is decorated with Italian marble and Burmese wood. I found this very interesting skull design appearing at the bottom of both the towers and thought it quite an interesting feature. My visit to Bloemfontein was very quick. We got there on the afternoon of a public holiday and left the next morning quite early, so I didn't get a chance to get a visitor guide to the city giving all the information on the tourists attractions. Its actually been very difficult finding info to accompany the pics on here over the last couple of days as the stuff on the internet has also been very limited. 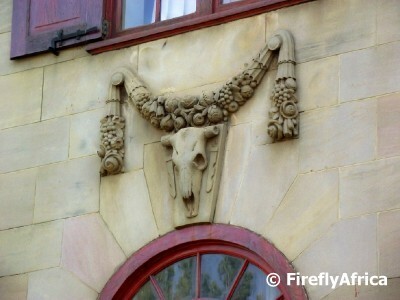 Anyway, the picture above is of the building right around the corner from the City Hall and seemingly attached to it. The only info I could find is that it might possibly be the Clarendon Hall.